Be the first to share your favorite memory, photo or story of Norma Jean. This memorial page is dedicated for family, friends and future generations to celebrate the life of their loved one. 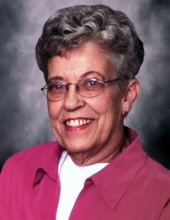 Jean Ballard, 80, of Midland, died Thursday, February 7, 2019 at her home. She was born February 9, 1938 in Sistersville, WV, the daughter of Lawrence and Nancy (Bates) Baker. Jean grew up in Gladwin, moved to Midland as a young adult and worked at the Midland Hospital, Midland Public Schools, Pendell Printing, and Walmart over the years. She enjoyed sightseeing, gardening, spending time with her family and friends camping and fishing at Rose Lake. Jean and her husband Harold also enjoyed wintering in Apache Junction, Arizona for over 20 years before Harold’s passing in 2009. She is survived by her children Kirk (Kelli Weakman) Fetterolf, Tina Ballard-Atkins and her husband Ken, Elmer (Mary) Ballard, Debbie (Doug) Campbell-Kelsey; grandchildren Jacob (Jodi) Fetterolf, Jared Fetterolf, Mitch Atkins, Mark Atkins, Cheryl Smith, Diana Overzet, Barbara (Matt) Dodge, Jason (Haley) Campbell; numerous great grandchildren, brother Art (Glenda) Baker, sisters-in-law Bonnie Chubb, Marlene Ballard and her brother-in-law Frank (Marilyn) Ballard. She was preceded in death by her husband Harold, brother Ed Baker and sister Ann Hall. Funeral services will take place at 11:30 am, Tuesday, February 12, 2019 at the Ware Smith Woolever Funeral Home, 1200 W. Wheeler Street, Rev. Dr. Wallace H. Mayton III officiating. Jean’s family will receive friends at the funeral home on Tuesday from 10 am until time of services. Rather than flowers, memorials may be offered to Senior Services, Memorial Presbyterian Church, or the donor’s favorite charity. To plant a tree in memory of Norma Jean Ballard, please visit our Tribute Store. "Email Address" would like to share the life celebration of Norma Jean Ballard. Click on the "link" to go to share a favorite memory or leave a condolence message for the family.